Native to southeastern Europe, Centaurea stoebe has been introduced to the whole of Europe, as far north as southern Sweden. The nomenclature of Centaurea stoebe in the broad sense has been a source of confusion in European literature for about 200 years. The names used in that group (C. stoebe, C. rhenana, C. maculosa, C. biebersteinii) have been applied to different taxa by different authors with varying circumscriptions. Different species concepts were used in western and eastern Europe. Unfortunately this fact was not taken into account properly in the treatment by J. Dostál (1976). Recent studies have shown that the American plants are identical with plants introduced to the whole of Europe (J. Ochsmann 2001). Subsp. 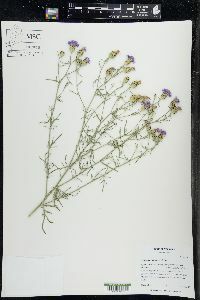 micranthos, a tetraploid perennial, is clearly distinct from the diploid, biennial plants native to central Europe known as C. stoebe Linnaeus subsp. stoebe, C. rhenana Boreau, or C. maculosa Lamarck. In most American literature the name Centaurea maculosa Lamarck has been misapplied to C. stoebe subsp. micranthos. W. A. Weber (1987, 1990) treated this taxon as Acosta maculosa (Lamarck) Holub. The treatment of about 100 species of Centaurea sect. Acrolophus Cassini as the genus Acosta by J. Holub (1972) and others is supported by neither morphologic nor molecular characters and is not widely accepted in Europe.